Pencil on archival paper, 11" x 8"
My wife & I love this one! 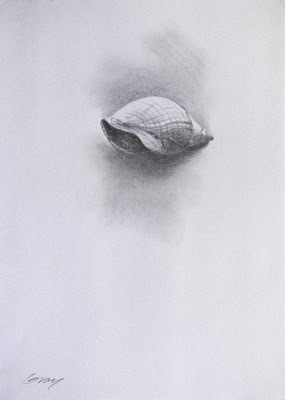 These are lovely shell drawings. I can see the house that would look so good wrapped around them. What a wonderful way to say it, Ruth...thank you! Soft and subtle and dreamlike! It almost appears to float! Dean--I liked the idea of these objects floating on the white page, so I'm glad you saw it that way--thanks!